The Contacts section of your admin panel will allow you to add new contacts and manage your existing contact list. This includes importing contact lists, sending your opt-in emails, assigning contacts to groups, and more. When first clicking on the main Contacts tab in the admin panel, you will be taken to your list of contacts. Here you can see a full list of contacts that have either submitted a form on your website, have been manually added to your list, or have been imported to your database. This overview of contacts will provide you with general contact information such as email, first and last name, and phone number. You will also be able to see if a contact has Opted-In to receive your emails, the number of times the opt-in email was delivered to that contact, and the date they opted-in if they have done so. From the Actions column you can view, edit, or delete a single contact. 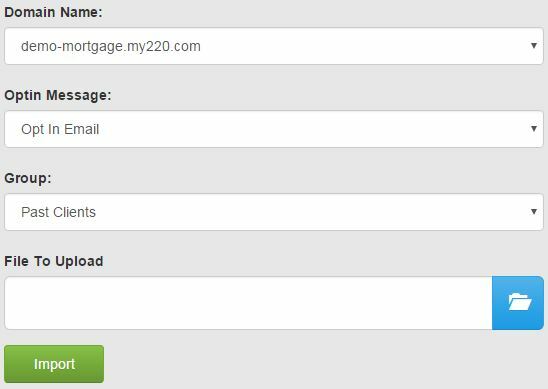 The top row of buttons will allow you to add a single contact, import a list of contacts, resend your opt-in email, and export your list of leads. We will cover each of these actions below. To view or edit a contact click the view or edit button in the actions column. If you selected View you will be taken to the contact details seen below. Selecting edit will display the same information but you will be able to update each of the fields. When viewing contact details, you can toggle between editing and viewing the contact by clicking either the pencil icon (edit) or eye icon (view) in the upper right corner. You also have the ability to Export a Contact to PDF or Email a contact directly from this page. To import a list of contacts, click on Import Contacts above your list of existing contacts. Contact lists will need to be in a Comma Separated Values file, or .CSV file which can be created through Microsoft Excel. There are a few different CSV options in Excel. Be sure to select the Comma Delimited option. Please pay close attention to the formatting needed for the CSV file. The header row must be exactly as you see it below or the contacts will not be imported. Once your list of contacts has been properly formatted and saved as the correct CSV file, you can upload your contacts. Select your domain name, opt-in message, group (if needed), and the contact list file. Once everything is selected click Import. When your file upload is complete, you will be able to review your results as well as the results of any past uploads. The Status column will indicate if your file upload has completed, if it is still processing, or if the file was invalid. If your file is invalid, please review the formatting requirements when uploading your contacts. If your file uploads successfully, the Results column will provide the Total number of opt-in emails sent, the number of Errors encountered, the number of Duplicate contacts, and the number of contacts with Missing information (email and phone). 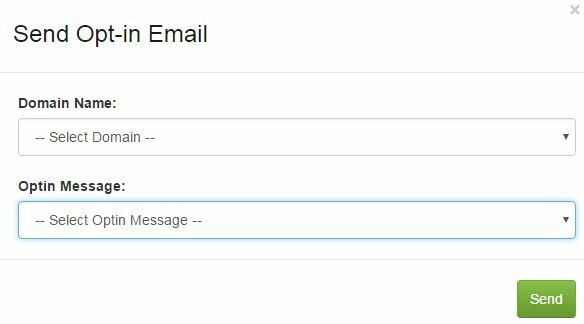 To resend your opt-in email, simply check off the contacts you wish to resend the opt-in to, and click the large blue Resend Optin Email button above your list of contacts. To send the opt-in to all contacts who have not yet opted-in, click the All button next to the opt-in button. This will display all of your contacts. Next, filter your contacts by clicking the Opted In drop down and selecting No. Lastly, click the checkbox to the left of the column titles to select all of the displayed contacts. All contacts who have not yet opted-in will now be selected. 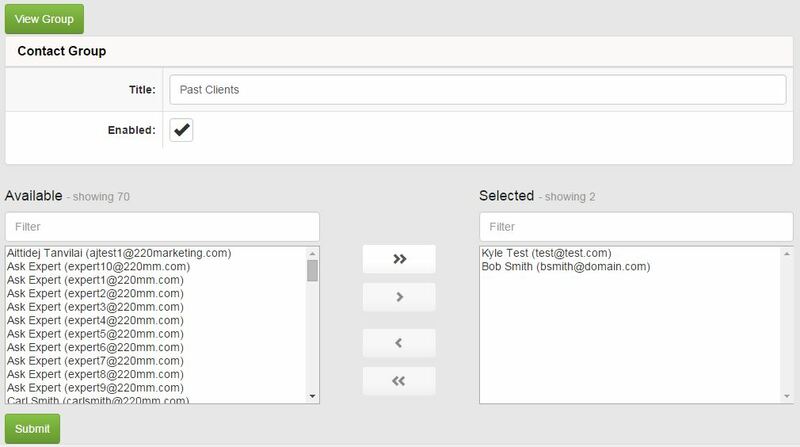 Once you have clicked the Resend Optin Email button, a pop up box will appear for you to select your domain and opt-in message. Once you have done so, click send. Note that you can only send the opt-in twice and you cannot send the second opt-in until 14 days after the first was sent. 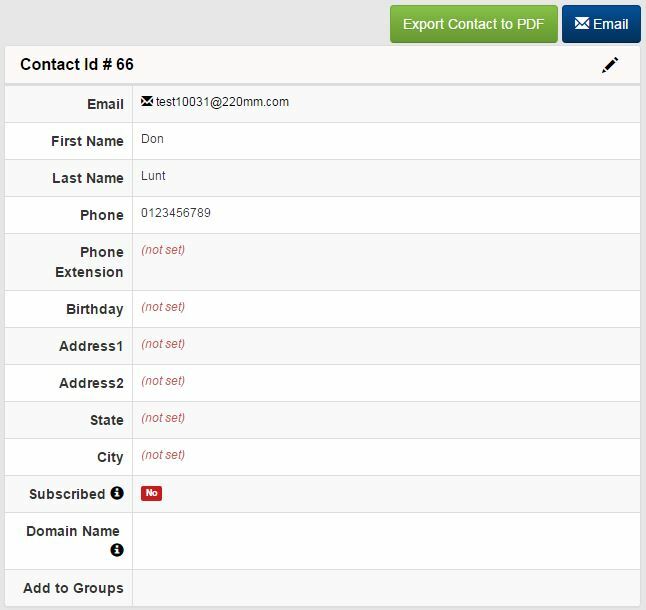 By clicking the Export All drop down, you can export your list of contacts in various formats including HTML, CSV, Text, PDF, and Excel. Click the menu button next to Export All to select the fields you wish to import. Groups of contacts can be created and managed by clicking on the Groups tab a the top of the Contacts section of your admin panel. To add a new group, click the green Add Group button. To view or edit an existing group click on the view or edit buttons. To add contacts to a group, click the contact you wish to move under the available column, and then click the single arrow pointing to the selected column. To move all contacts from Available to Selected, click the double arrow button without selecting anyone. To select multiple contacts, hold down the Ctrl key when clicking them, and then click the single arrow button. Follow the same steps to remove users from a group.